Stuck for a space-themed Christmas present? How about some LEGO. Women of NASA LEGO was proposed and submitted to LEGO Ideas by Maia Weinstock, science writer, LEGO enthusiast, and deputy editor of MIT News, in summer 2016. It quickly gathered support and soon reached the 10,000 votes necessary to get an idea into LEGO Review. Women of NASA was selected for production in February this year; it’s available to buy now, so you can gift it (or own it yourself) in time for Christmas. LEGO women of NASA went on sale in November and looks set to be a Christmas best seller. 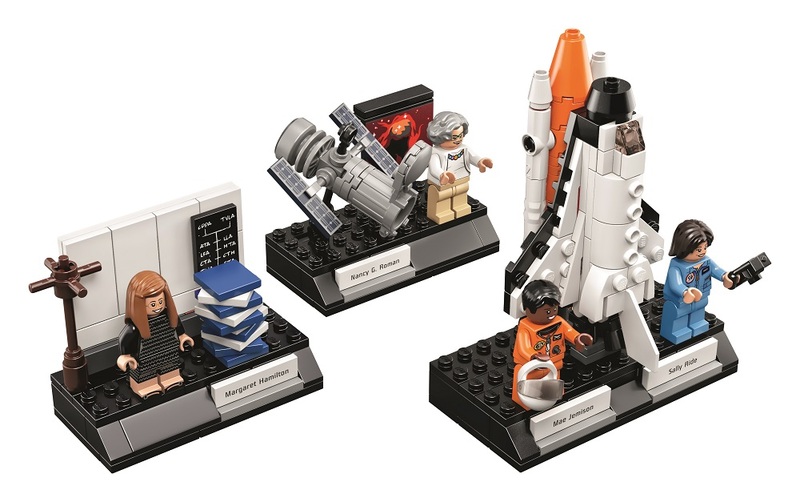 Follow in the footsteps of 4 pioneering women of NASA (National Aeronautics and Space Administration—America’s space agency) with this fun and inspiring LEGO set. Build the Hubble Space Telescope and learn astronomy with the ‘Mother of Hubble’ Nancy Grace Roman. Develop the software for space missions with computer scientist Margaret Hamilton. And launch the space shuttle with Sally Ride, the first American woman to fly in space, and Mae Jemison, the world’s first woman of colour in space. Build, play, learn and one day you too could become a science, technology, engineering or mathematics superstar!